A version of the Monte Cristo sandwich not dipped in batter and fried. 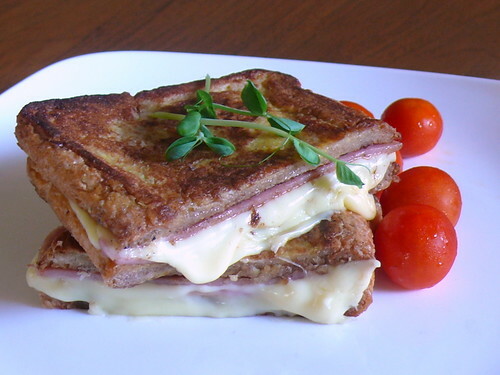 Don't believe anyone who tells you a Monte Cristo sandwich is like a croque monsieur because it's not. A Monte Cristo sandwich is a ham/turkey and cheese sandwich dipped in an egg, flour and milk batter and deep fried. That sounds like typical greasy American diner fried food which can be very tempting to some but gross to me. I searched for a healthier version and found it in Saveur. The bread is French-toasted, then sandwiched with slices of ham, turkey and cheese and then pan-fried. Because the recipe said to press the sandwich while frying, the resulting sandwich tasted like the heavy compressed piece of French toast that it was. Disappointing so I won't give you the link to the recipe. Next is a totally thumbs up recipe. This is pizza fritta, fried pizza. I thought it tasted better than baked pizza although it was oilier. The golden fried pizza bases looked like naan and yu ja gui but were pillowy soft. Absolutely delicious! According to Jamie, this is how the first pizzas were made: fried in a pan and then grilled to melt the cheese. Just roll your dough on a lightly floured surface into a small piece (say hand-size) about 1/4"/0.5 cm thick, it doesn't have to be regular circle, let it rest 10-15 minutes and fry in 1/2 cup of oil in a small pan. Turn over afer 30 seconds and fry another 30 seconds, remove and place on a kitchen paper to catch the oil, then put on a baking tray. Smear each base with a spoonful of tomato sauce, top with (buffalo) mozzarella and dried oregano or basil leaves and put under a hot grill (Wey used the toaster oven grill) until the cheese is melted. Wey was resourceful and used whatever ingredients he found in the fridge. 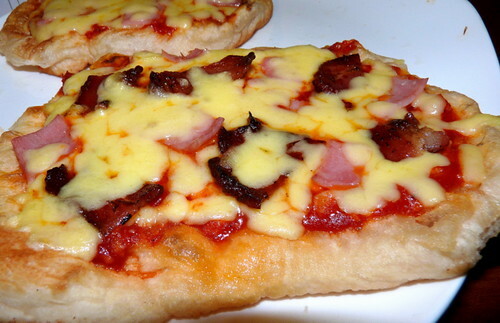 Thanks to Wey, I've discovered pizza fritta! sandwiches, gifts form the gods. sliced into thirds to create 3 triangular pieces so that it can then be easily dipped into the side dish of honey-mustard sauce or 1000 islands dressing that accompanies it. the place where i first had to cook this sandwich as part of my line duties also had another grilled sandwich that i like. open faced buttered rye is laid on the griddle (butter side down) and topped with roast beef and cole slaw (that has been drained of any extra mayo dressing) and that is all then topped with swiss cheese. about 85% of the way through cooking process it is spritzed with a mist of dry white vermouth, this gets the cheese to melt faster and adds a bit of flavor. serve with a good brown grain mustard. the vermouth trick is also great for cheeseburgers. put some in a small plant sprayer and keep it around. you will surprised how often you reach for it when making hot sandwiches or burgers. it's fantastic. i swear u'll be stuffing urself with cheese and the site tells u what compliments each type of cheese. it's very interactive as well and teaches u how to pronounce the names of the drinks and cheese, so tune up the volume! look simple and delicious, well done! "The boy reads cookbooks at bedtime and has stored up many recipes to try." I hope to have a child like yours! Agnes (http://agneshee.blogspot.com/) has some good shots of AD/Dubai. Take a look so you know what to expect. way to go Wey! He proved his self in love in cooking. There is another pizza fritta thingy call Panzerotti, its from north Italian, it a deep frying pizza, using texture like spongy doughnut dough and fold with cheese and ham. i get the info from other blogs too. Sad about the sandwich. I actually love a heavy ham and cheese sandwich, but then I fill them with lots of stuff. Sorry it didn't work for you, though. On the other hand, Wey's pizza sounds/looks terrific. Let's hope he keeps up with his cooking. We may watch him one day on a Chef Show!!! very impressive! you can be gud chef in future!